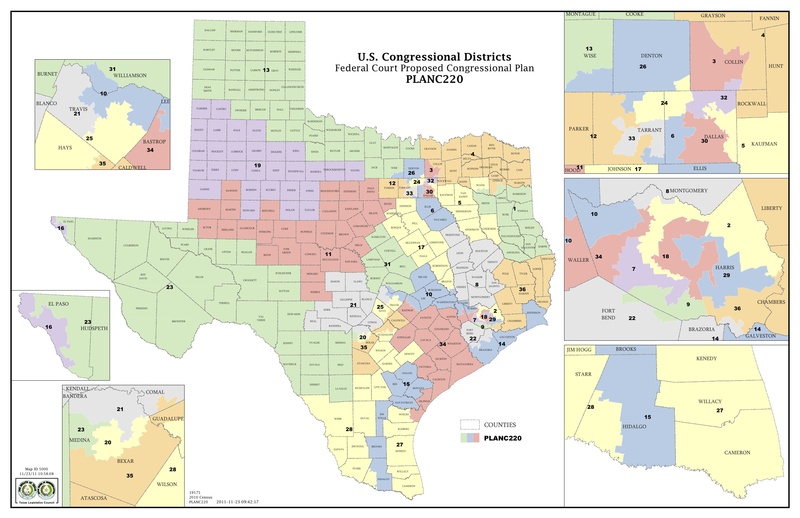 In a move that has left many scratching their heads and a few scrambling to figure out what Congressional District they want to run in, Clinton-appointed Federal Judge Orlando Garcia today released a proposed redistricting map for Texas. The new map makes wholesale changes to the map drawn by the Texas Legislature (as required by the US Constitution). Allegedly the maps were redrawn by the judicial panel in order to more correctly represent the increases in Hispanic population in Texas. But in reality, the new map gives more favor to Democrats than minorities. For example, the new map puts incumbent Congressman Francisco "Quico" Canseco seat in danger. Calls had been made to create a new Hispanic district in the DFW Metroplex and yet, the new seat proposed by the judges creates a new "black" seat instead of an Hispanic district. The big winner in the game of musical chairs is Congressman Lloyd Doggett. You remember him... He's the guy who tried to re-write the Texas Constitution from Washington DC with his amendment to an education funding bill that would tie the hands of future Texas Legislatures to determine the Texas budget... Well, under the old plan he was going to have a primary opponent, Joaquin Castro. Under the new plan, Castro and Doggett will run unopposed in separate districts. However, for some reason, the National Association of LATINO Elected and Appointed Officials (NALEO) seems pleased with the results. In a statement released Wednesday, NALEO said "Latinos accounted for 65% of Texas' growth last decade, which resulted in the state gaining four additional Congressional seats. The Congressional map enacted by the state legislature did not reflect this growth, and would have severely violated Latino voting rights. We are pleased to see the results of the court challenge that produced the new Congressional plan, and we urge the court to order these maps into law." WHAT!? Did they even bother to read the new map before commenting or are they simply happy that it is not a "Republican" map. Here's a news flash... It wasn't a "Republican" map. It was a map drawn by the duly elected Texas Legislature as required by the US Constitution. A resolution in the San Antonio case is being held up by a separate case in Washington, in which a federal court refused to approve the maps. That court agreed with the U.S. Department of Justice that there was sufficient evidence to question whether the new maps hurt minority representation. That cleared the way for a trial and all but guarantees the 2012 elections will be conducted with temporary, court-drawn maps. The map is only temporary as the real judicial panel (Washington case) is still deciding if the map drawn under the Constitutional method by the Texas Legislature meets their bidding or not. It seems the Constitution does not apply to Texas. We aren't allowed to draw our own maps without an unconstitutional babysitter, namely either the US Justice Department or federal courts. Neither of these methods are authorized by the Constitution. If Justice or the courts don't like the map, they should toss it back to the Legislature to fix the map. We should not have unelected officials performing the constitutionally required duties of the state legislature. Here is what I mean by that. When the courts rule a law is unconstitutional, they don't fix the law (legislate from the bench). They send the law back to the legislative body that wrote the law and tell them to fix it. Or they throw it out all together. The same process should apply to these maps. The Constitutions requires the state legislature to draw these maps. Not the executive branch or judicial branch. On a personal note... I am currently sitting in the 18th Congressional District, represented by the infamous Congresswoman Sheila Jackson Lee. I moved here after learning that my new home would soon by represented by the 2nd Congressional District, Judge Ted Poe. Well, it seems the new map rips that salvation right out from under me and places me back in Ms. Jackson-Lee's 18th. I guess the Congresswoman will have to put up with my letters and mail for another couple of years. Sorry Sheila. If the proposed plan goes into effect, Republicans could lose as many as six seats compared to the plan drawn by the Texas Legislature. After all, the whole idea is to increase minority representation... Right? WRONG! It seems the point is really to make sure Texas does not get too firm a hold on Conservative politics. The plan is not final. Republican officials will have until the end of this week to provide input and suggest changes. So, if you are rushing to the party headquarters to pay your filing fees, you may want to cool your jets for a couple of days. Sources also tell me that Texas Attorney General may challenge the plan to the US Supreme Court. Last week temporary plans for Texas State Representative Districts were released causing a scramble of new filings in those races as well.